WELCOME TO BOVANI'S TOWING & SERVICE CENTER! Bovani's has been providing towing & recovery services for over 40 years in the Northeast, PA region and beyond. 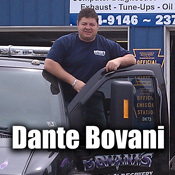 Bovani's is family owned & operated and has helped thousands of people over the years when those unfortuante circumstances happen with your vehcile. We can transport, tow, handle accident cleanups, and much more with our robust fleet of towing equipment controlled by our professional towing experts. No job is too big or too "ugly" for Bovani's. We're here to rescue your disabled vehicles, transport vehicles from unfortunate accidents or provide safe voyage for new or vintage classic vehicles. In addition to our towing & recovery services, we are a full service auto repair garage and also provide State & Emissions Inspections. We know your time is a valuable thing, and that's why we provide you with a fast response. Whether you need flat tire service, gasoline, or any other help with a stranded auto, we get the job done fast and efficiently getting you back on the road. Our timely towing service will help you with your towing needs 24 hours a day, 7 days a week. We have a variety of trucks in our towing truck fleet including wheel lift and flat bed trucks so we can handle any type of tow. Bovani's Towing & Service Center is licensed and insured for your protection and peace of mind. Contact us for more information on our towing and automotive repair services.